There’s been a long silence from this blog. My latest project hasn’t been going all that well. It’s Vogue 8825. I fell in love with the design when it came out: the sleeves! I didn’t initially realize it was a pattern for knits so decided to make it up in the electric blue chiffon I got from Birmingham Rag Market. A quick look at the pattern soon revealed the problems with that but I carried on anyway, tracing a size larger than normal and altering the sleeves and cuffs to have a button closure. I intended to put in a side zip so I could get in and out of it. And sew it with French seams wherever possible. Some weeks later and I’ve got as far as only having the side seams (including that zip) and the sleeves/cuffsto do (and hemming of course…) but I’ve got no desire at all to finish it. Maybe it’s because the weather has turned really cold again, or the French seams are just too fiddly, or I’m avoiding putting a zip into one of the least well-behaved fabrics I’ve ever sewed with. So today after a week of not sewing at all I put it away and got out some wool jersey. I have some delicious colours and thanks to all your helpful comments on my post about long sleeved dresses a few warm patterns to try. And it feels like such a relief to put the chiffon dress away. Should have done it days ago. Posted on February 9, 2013 February 9, 2013 by catherinedaze	This entry was posted in dressmaking, Fabric, sewing and tagged dressmaking, fabric, quitting, sewing. Bookmark the permalink. ← Is it weird to prefer your backup machine? A very therapeutic decision! Have made a few of those myself lately! Hope you recover enough to try the pattern again sometime, the sleeves are gorgeous! As are the wool jerseys. Onwards! Those wool jerseys are amazing. A really nice dress… if the chiffon gives you trouble put paper tissue in between and sew .. this stops it slipping. Of course you probably already know this but just in case. Those sleeves in chiffon would be amazing so I’m not surprised you went ahead anyway! The wool jerseys look amazing, and will be a huge relief to work with after fighting with chiffon. I love the idea and effect of chiffon, but it IS a PITA to sew. Good for you for walking away – perhaps you’ll come back to it after a break with a fabric that has some common sense and knows how to behave properly. Sometimes it’s very hard to put something fine. At times a little break makes all the difference. And with those gorgeous jerseys waiting for you – why not! Sometimes you just have to let something go. Perhaps you’ll want to finish the dress when the weather is warmer. 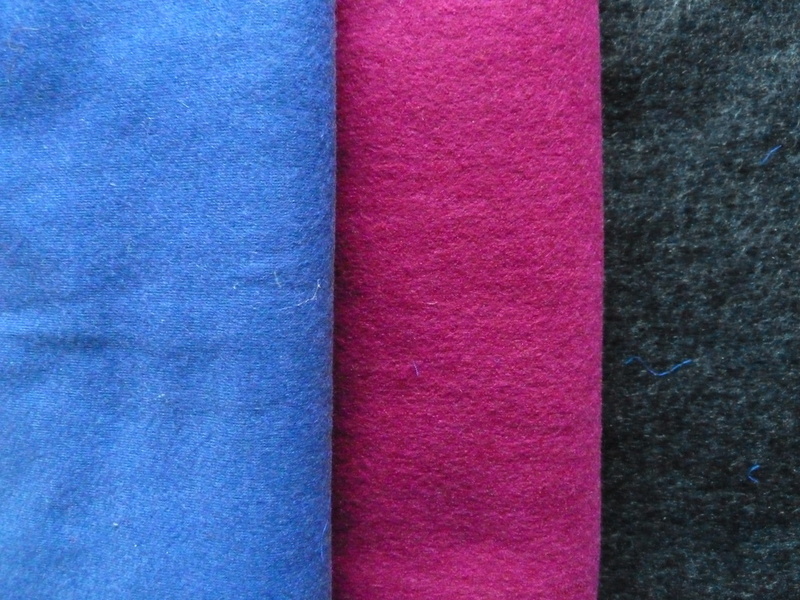 Your wool jerseys are beautiful. I’m looking forward to seeing what you make with them! What great colors! Sounds like a wise decision. Ooh! Love the wool jerseys. Where did you get them from? Thanks! The violet one (which looks more blue in the picture) was from Ditto and the others are from Truro Fabrics. They’re all quite heavy so going to have to pick patterns carefully. Those wools are gorgeous. I hope you have some fun with those! Good idea always good to put things away for later when you can give them another go with ‘fresh eyes’-although I’d highly recommend a narrow hem presser foot as the perfect alternative to French seams and a row of poppers (press buttons?) as an alternative to a zipper. It’ll be in the side right? So it’ll get hidden by the sash anyway. You can buy the pre-made mini-popper tape (made for kiddie clothes) very low profile and light so they won’t distort the fabric near the side seam. I do hate it when you reach that stage – so disheartening. I do what you have done and start on something else. Unfortunately with me, I rarely go back and these half finished items lurk in carrier bags in drawers out of sight! One thing that may help ( something I read on-line and made a note of ) is to mix 3 teaspoons of glycerine with some cold water, then add 3 litres of cold water to this. You then soak the fabric for 1 hour. Dry and then iron. This makes fabric like this more managable. I cannot vouch that it works, but it maybe worth it if you decide to give up entirely. Yep put it away – good decision. Sewing is supposed to be fun and interesting and all that. Not annoying. I bet you’ll get the urge to pick it up again, or make the dress in a different fabric that isn’t going to drive you nuts sewing it. Cool dress for another time.